Day Two of Jerry Tindell Riding Clinic. Once again the day started with a lecture in this cathedral in the pines, with Jerry dispensing wisdom learned from decades of working with both animals and humans. All of us are here because we want to become more observant, more aware, and in turn to become more at ease with our animals so that we can experience places like this in safety and good company. Every attendee was different, from all walks of life, and all the mules and horses had quite different personalities. So while learning to work with our own animals we also got quite the education watching everyone else work theirs. We went back out to the meadow, and once again loped around and did circles and had plenty of room to pretend we were herding beeves around in an old episode of Rawhide. 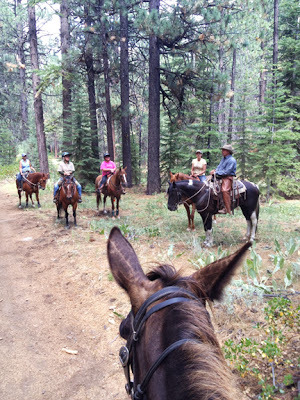 Then our host took us on a long meandering ride through the forest. He has ridden this property for decades, and forgoes following roads in favor of striking out across the wild acres and experiencing the mountain the way people did when they traveled here in past ages. We saw mule deer, listened to birds, and always my careful mule found safe footing for our passage. Finally we turned back towards camp and were thrilled by the sight of Recon Mountain on the peaks above us, and learned that it was to be our goal to climb to the top of it tomorrow. With the thought of that challenge to inspire us we returned to another sumptuous meal and a bit of campfire conversation, and then everyone tuned in early to rest up and be ready for the big climb.